The International Brotherhood of Teamsters, one of the largest labor unions in USA, has announced that they no longer support President Bush's platform for oil drilling in the Arctic National Wildlife Refuge. 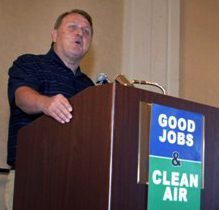 During a summit in California on "good jobs and clean air" Teamsters General President Jim Hoffa announced that their labor union is leaving the ANWR coalition. "We are not going to drill our way out of the energy problems we are facingâ€”not here and not in the Arctic National Wildlife Refuge. We must find a long-term approach that breaks our dependence on foreign oil by investing in the development of alternate energy sources like solar, wind and geothermal power." Jim Hoffa also said that if the USA invests in green renewable energy it would "reap the benefits of curbing its dependence on oil through a revitalized economy with the creation of millions of new jobs in a rapidly growing industry". "Our economy is in shambles. Gas is climbing to $5 a gallon. The dollar has collapsed. Inflation is on the rise. Americans are seeing their paychecks shrink. Their family health care is being slashed. Finding a long-term solution has a tremendous upside. It will be environmentally friendly and will serve as a much-needed boost to our sagging economy."